Heart's Delight Cards: Happy Fall, Y'all! Woohoo!!! Today is the first day of Fall, the Autumnal Equinox, the start of my favorite time of year! From now until New Year's Day all the things that I love happen. Cooler days, the colors of Autumn, the candy of Halloween (heh-heh), the traditions and good eats of Thanksgiving, and the sweet treats of Christmas. Hmmm, do I detect a recurring theme here? I'm getting a food coma just thinking about it! Last year I bought some small pie pumpkins and after cleaning & cooking them until soft, I processed them in the food processor until smooth. Holy WOW! What a huge difference between the tinny-tasting canned stuff, and the velvety, slightly sweet home made pumpkin puree. I'll be doing that again this year, and NEXT year will grow my own pumpkins to process! 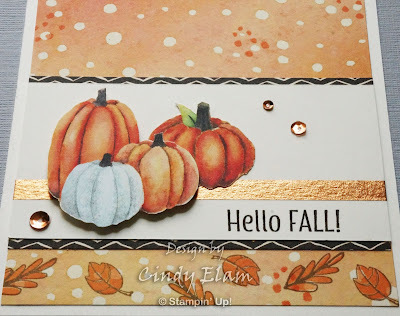 All of that to say, I have pumpkins on the brain today, and what better way to celebrate all things Autumn and pumpkin-y than with the cute pumpkins in the Painted Autumn DSP? 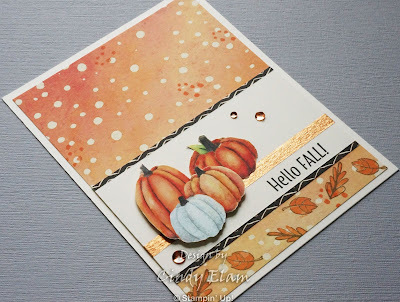 It sure makes quick work to just cut out the pumpkin images, stamp a few of the elements in Merry Café and put them all together on a cute card. I used three different patterns from the DSP, and after adding a strip of copper Washi and a few copper sequins, the card was complete! 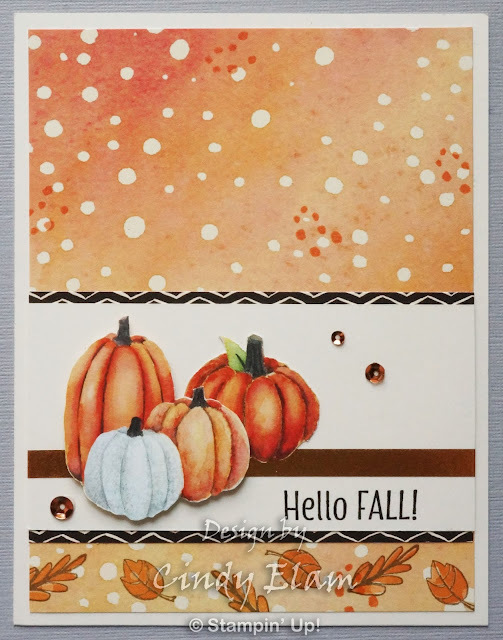 Greeting panel: Very Vanilla 2" x 4"
DSP mat: Painted Autumn 2-1/4" x 4"
Background DSP: Painted Autumn 4" x 5-1/4"
Card base: Very Vanilla 5-1/2" x 8-1/2"